When it comes to driving safety, not all sunglasses are created equally. The color and tint of the lenses can affect how our eyes adjust to outside conditions while the frames can restrict our fields of vision. Our everyday shades may not be the best option when we get behind the wheel. "You probably wouldn't wear the same pair of shoes to go dancing as you would jogging. You have different shoes for different tasks," Dr. Karl Citek, a professor of optometry and a member of the American Optometric Association, says. "It's the same with sunglasses." Driving during the day means facing the sun's glare which can cause our eyes to squint and become strained and fatigued. Even more dangerous is the bright light reflected off the road's surface and other vehicles. "We refer to that [light] as 'veiling glare,' and it obscures the object you're looking at," Citek says. "Technically, for that brief moment, you're blinded." The right shades can help reduce the driving risks associated with glare and can lessen sunlight exposure and limited peripheral vision. Here's what Citek recommends you look for. Before you buy, think about what your usual commute looks like. Places with many overcast days or environments with heavy shade might not require the same degree of lens darkness that driving directly into a sunrise or sunset might. Geography may play a role, too. Some regions have more intense sunlight than others which means that a pair of sunglasses might be an all-day accessory—especially for those with light hypersensitivity. When shopping for new glasses, hold them at arm's length and look at a straight line, like a countertop edge, through the lenses. "If the view appears curved, blurred, or distorted in any way, the sunglasses are probably poor quality," Citek says. 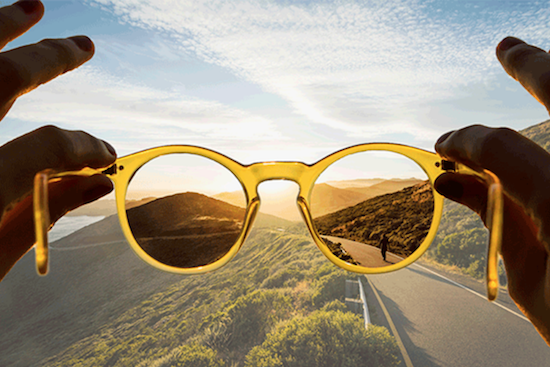 Polarization absorbs the reflective glare that bounces off both the road and oncoming cars, and it allows you to focus clearly on what's in front of you. This feature is usually labeled somewhere on the frame, but here's how to do a check yourself: put the sunglasses on and slowly tilt your head to the left or right of your smartphone or laptop's screen (which is usually slightly polarized, too). If the screen appears dark or seems to change color, the lenses are polarized. Even though car windshields already offer UV protection, your sunglasses should block 100% of the sun's UVA and UVB rays—which can cause corneal sunburn and other issues. Look for a tag or label that says the shades provide total protection against both UVA and UVB rays. Pink, blue, or green lenses might look like fun, but they can make red traffic lights indistinguishable from yellow lights. Instead, go for a dark gray tint. "[The tint] reduces brightness evenly while leaving colors intact," Citek says. The bigger the frame, the more protection your glasses will provide—but only if they're fitted to your face. Look for a wraparound style that's snug to the sides of the face with lenses that are close to your eyes. The lenses should be large enough that the frame's arms don't get in the way of your peripheral vision; they should allow you to see out even as they block light coming in from the side.